You made the decision to buy a new, quality sprinkler. Now, it’s time to get down to business and find the right one. At Big Sprinkler, our passion is to find high-quality irrigation solutions to your problems and we’ve got the knowledge to help you find something to fit any situation. One of our recommendations will likely be our most popular product, the 1000F Wheeled Sprinkler Cart. It's flexible, durable, and easy to use. While popularity doesn’t always mean it’s the best, there are three categories where the 1000F captures our vote of confidence. The sprinkler head, the cart, and the performance are all rated highly and your lawn and garden will thank you for this decision. The sprinkler head is an integral part of any irrigation system. On the run-of-the-mill sprinklers you find in big box stores, the quality of the head is made to be affordable, not for longevity. The 1000F system boasts a commercial grade sprinkler head made for both durability and longevity. Since the size of the nozzle attached to the sprinkler head dictates how much flow goes through the sprinkler, getting the right size for your flow rate is important. When you choose the 1000F, you receive a set of five nozzles, allowing for versatility. 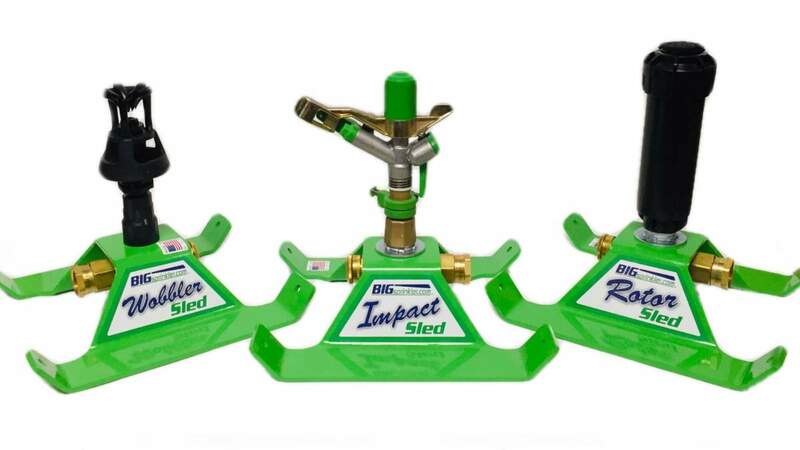 Not only will you get what fits for your lawn and garden today, but you have the choice of using the same sprinkler cart if your situation changes. The versatility of the 1000F doesn’t end with the choice of nozzle. You can set the sprinkler head to make a full circle or restrict it to a partial circle, which gives you full control of where your water is being used. A jet stream breaker is also included which allows the water pattern to be fine-tuned based on your pressure. No matter what area you need to cover, this sprinkler will allow you to get water where you need it without undue waste. We take a lot of pride in the carts we sell at Big Sprinkler. The carts are each made in our shop where we fabricate and weld them ourselves. It’s easy to stand behind the product because our quality control process allows us to inspect each step in the production process. We know these carts won’t fall apart. We use one inch, schedule 40 steel tubing to create the body of the cart, along with one and one half inch solid steel axle design for the wheels. When the quality and care of the production meets the top-notch materials, you have a wheeled sprinkler cart on which you can depend. To take the dependability and enhance it with longevity, each of the carts we make is sandblasted to remove any outward-facing impurities. They are then powder-coated with a baked on finish to create a more long-lasting protective coating on the metal than paint can provide. As mentioned before, the versatility of the 1000F sets it apart from other irrigation solutions for your yard. 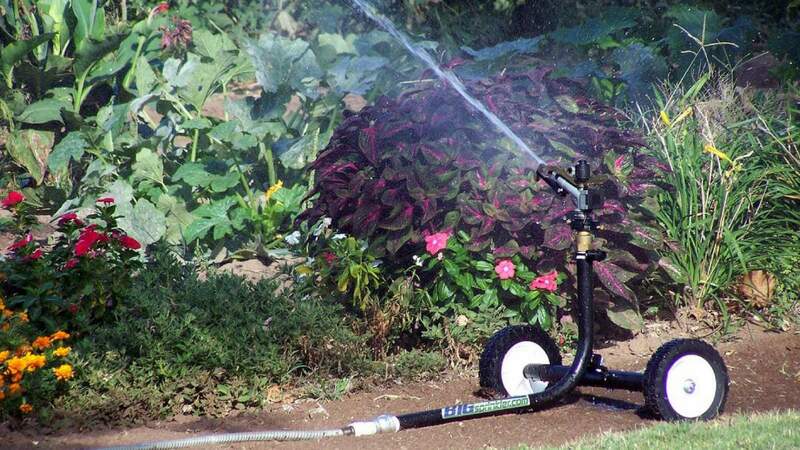 It’s the largest sprinkler that is compatible with a garden hose. It works in your yard, hooked to city water at six gallons per minute (gpm). However, it can also connect to a pump or hook to a well with flow rates of up to 25 gpm. The sprinkler is made from heavy-duty aluminum and is an impact-style sprinkler. The strength of the jet spray from an impact sprinkler creates a steady arch of water which is less affected by wind. The spray pattern will reach up to 120 feet in diameter, which means you need to move the sprinkler cart less often. Do you have questions about sprinklers in general? Check out our FAQ page and see if we’ve covered the answer there. If you continue to have questions or want more information about the 1000F Wheeled Sprinkler Cart, don’t hesitate to contact us by email or call us to learn more.